Black is Back Coalition makes history showing how to utilize electoral politics to forward black self-determination! The St. Louis Akwaaba Hall was packed with Africans from all over the country eager to participate in the BiBC's second electoral school. For both days, the room was packed with Africans who had traveled from all over the country to participate in this groundbreaking two-day program. All of these participants represented every political tendency within the African Liberation Movement and they all united in taking our struggle into the electoral arena. In the past, the methods of struggle for the liberation of our people have been posed as either the ballot or the bullet, where the system promotes the electoral arena as the only area for legitimate political struggle while simultaneously dismissing the interests of the African working-class. While the liberal petty bourgeois sector of the African Nation struggled for voting rights to assimilate successfully in the system of parasitic capitalism, the African working-class lost our lives to vote believing that it would change our material conditions. Shortly after the U.S. conceded to universal suffrage, winning Africans the right to vote in 1965, the U.S. government went on to wage a war on the Black Liberation Movement, assassinating and imprisoning our leaders, replacing our demand for Black Power with an imperialist agenda under the guise of the Democratic party. This assault, otherwise known as counterinsurgency, marked the distrust of the electoral arena by our people, that left our people with greater devastation. Our struggle has advanced since this period of attack, and this school was further proof of that. The Black is Back Coalition (BiBC) for Social Justice, Peace, and Reparations has cracked wide open a new era, where today we are able to redefine the struggle as one using every method─the ballot and the bullet. The electoral campaign school dealt with the various components of elections, including running for office, fighting for ballot initiatives, referendums and recalls. The school armed our people with a program that actually speaks to our interests and won unity with the understanding that the National Black Political Agenda for Self-Determination should serve as the basis for all electoral campaigns. The BiBC’s political agenda provides us with a program that is both historical and timely. In this way, the Black is Back Coalition has turned over to our people custody of an electoral process that has historically been separated from and used against our people and struggle. We now have a tool that we can use to positively affect the lives of our community. The Coalition’s first campaign school occurred at the Uhuru House, Akwaaba Hall in St. Petersburg, Florida in April 2017. This year, the school served as the grand opening event for the African People’s Socialist Party’s new Uhuru House in St. Louis, Missouri. The Uhuru House on Florissant Avenue is one installment of many to come, as part of the Black Power Blueprint Project, architected by Deputy Chair Ona Zené Yeshitela. It rests in the heart of the impoverished black community, in the city that has come to be known as “Ground Zero” for African resistance or the frontlines of our movement. It is considered this because of the rapid leap in consciousness of our people since the ‘60s, where our movement was crushed and our people forced into political isolation, reignited after the African working class came out to protest the brutal murder of 18 year old Mike Brown. It was this time in history that the African People’s Socialist Party (APSP) knew we needed to have a presence in St. Louis and a few short years later, this powerful economic development plan was initiated. The Black Power Blueprint is an anti-gentrification, black-led self-determination project. It is a shining example of what the African working-class can and will accomplish with our own Black Power agenda. Day one was opened by BiBC Vice-Chair Lisa Davis introducing the Coalition steering committee and Deputy Chair Ona Zené, who gave a motivational presentation describing the last 10 months of on the ground organizing to build the Uhuru House. Chairman Omali Yeshitela delivered the keynote address to the body of the Coalition as well as all the school attendees, laying out the historical and material basis for elections as well as our people’s history with participating in them. “The Black is Back Coalition was formed at a critical moment, where Barack Hussein Obama had just been elected as the first black president of the U.S., showing us that imperialism is on its last leg. “Our people had come to believe that the election of Obama represented great progress, when in reality it was a testament to the defeat of the revolutionary movement of the ‘60s by the U.S. government. “It was this defeat that makes if necessary for the Coalition to be here today. The BIBC is an extraordinary coalition which has defied all expectations. “The people were ecstatic about the program. It was clearly the people’s program. Chairman then began to explain how the counterinsurgency effectively killed off the revolution by assassinating and imprisoning Malcolm X, Martin Luther King Jr., the Black Panthers, Patrice Lumumba, and the like, so that by the time Africans had died to gain the right to vote, we had nothing to vote for. The program that was thrusted in front of our people was that of the Democratic party, which has always put itself forward as the progressive option, the party of the people. The African petty bourgeoisie, who were opposed to revolution, were elected and suddenly became the faces of revolution. “The electoral arena has been left open and been addressed only by the petty bourgeoisie. “We want to make the electoral process accessible to the masses of the people. It has been in the possession of a narrow group of elite Negros in the community who are tied to some form of capital. “We want to make the electoral process acceptable to the masses, to the activists, to the people who are really honest and are trying to make stuff happen. The Coalition then voted unanimously to endorse all the candidates. 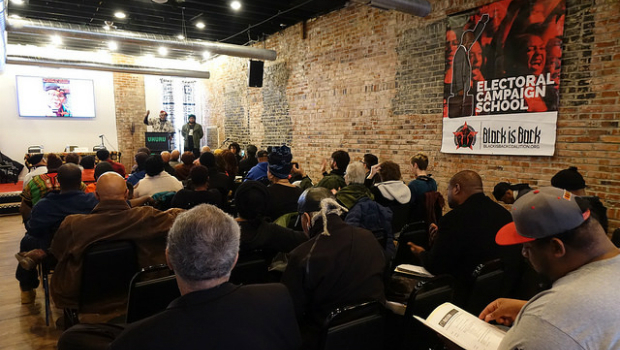 “We believe that we can open up a real new front in the struggle for Black Power through the electoral process, if we can get people to join this process! We have to use this process to establish what it is that our people should be fighting for. Just because somebody is black and they are running for office doesn’t mean that they are for us. “They must have a program that speaks to our interests and recognizes the historical oppression of our people! Attend the next Black is Back Coalition’s March, rally and conference this November 3-4, 2018 in Washington DC.